Four weeks after the Grenfell Tower tragedy, the BBC reveals that the Scottish based art therapy charity, the Teapot Trust is assisting traumatised children and teenagers. Art psychotherapist, Susan Rudnik, has worked for the Teapot Trust since 2016 typically supporting children with chronic illness and psychological trauma at Chelsea and Westminster Hospital. Susan Rudnik also lives close to the Grenfell Tower and witnessed the tragic circumstances first hand. 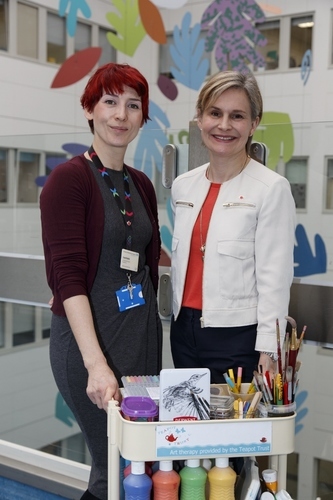 She quickly established the Art Therapy Hub within the ClementJames Centre based in North Kensington, where she and a team of art therapists support children and teenagers. The art therapy is being coordinated by Susan Rudnik who is supported by the Teapot Trust. Speaking to the BBC she said, “The children just have some art materials and they're free to do whatever they want to. "That's been enormously helpful in this crisis and trauma whereby the children are just allowed a space to process their feelings through the art when words really aren't enough or even possible quite a lot of the time." She added: "The tower features in a lot of their drawings because it's there, it's in everybody's eye shot. It's in everything, it's everywhere we look, it's everywhere we go. "But also, there's a lot of other stuff, there's indescribable things, a lot of mess-making, a lot of stuff that's just processing which isn't pretty pictures or even horrible pictures, it's just something in the art materials themselves that really make it possible for the children to process some of their feelings in a very visceral way." Dr Laura N Young MBE and her husband Dr John Young co-founded the Teapot Trust in 2010 after seeing the gaps in the care of their daughter Verity, who suffered from Systemic Lupus Erythematosus (SLE Lupus) and cancer before her tragic death at the age of eight, in 2009. Today, the Teapot Trust is Scotland’s largest employer of clinically trained art therapists, with 17 art therapists running 22 projects in 11 towns and cities, from Inverness to the Borders. It has also expanded into England, with two projects running for children at Chelsea and Westminster Hospital and Great Ormond Street Hospital. Charity founder, Dr Laura N Young MBE said, “Susan Rudnick has dedicated her career to art therapy. She is an expert in her field and must be commended for her tenacity and fortitude in reaching out to support others when she herself has witnessed such a tragedy first-hand. “The Teapot Trust needs to continue its support of the Grenfell tragedy through art therapy. We are submitting an application for grants to Comic Relief and to the London Community Fund which is supported by Simon Cowell who raised funds with the release of the charity single. Anyone wishing to make donations to The Teapot Trust can do so by contacting the charity on http://www.teapot-trust.org/donate-now/ or by calling 0131 273 4340. Interviews with Dr Laura Young MBE can be arranged on request. For more information please get in touch with Mary-Jane Rose at mary-jane@famouspublicity.com, Adam Betteridge at adam@famouspublicity.com or Tina Fotherby at tina@famouspublicity.com or call 0333 344 2341. This press release has been provided via pro bono work at Famous Publicity. This press release was distributed by ResponseSource Press Release Wire on behalf of Teapot Trust in the following categories: Children & Teenagers, Men's Interest, Health, Women's Interest & Beauty, Medical & Pharmaceutical, Public Sector, Third Sector & Legal, for more information visit https://pressreleasewire.responsesource.com/about.